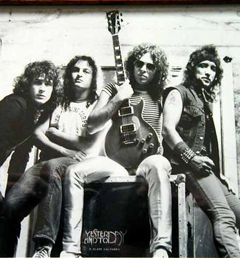 Long before Motley Crüe, RATT and Metallica were conquering the heavy metal world in the ‘80s, the San Francisco Bay Area foursome Y&T were exploding all over the ‘70s with a sound that vocalist/guitarist Dave Meniketti dubs “passionate, melodic hard rock.” Formed in 1974, their first two albums on London Records—the 1976 debut release Yesterday & Today and its 1978 follow-up Struck Down—set the pace for the metal phenomenon to come. When these other bands were just starting out, they all vied for opening spots on tour with Y&T. Later tell-all books by Metallica and Motley Crüe mention that they cut their teeth on those seminal Y&T recordings. In addition to selling over four million units over a total of 16 albums and three greatest hits collections, Y&T’s career accolades include performing on American Bandstand; winning two Bammie Awards; scoring five Top 100 albums; landing numerous tracks on the Billboard pop charts; and making multiple national and international TV appearances. True rock and roll pioneers, the band—whose original members were Meniketti, bassist Phil Kennemore, rhythm guitarist Joey Alves and drummer Leonard Haze—survived disco fever, rode the crest of the ‘80s hard rock insurgence, and remained faithful to melodic power ballads throughout the age of grunge. Perhaps Y&T’s most widespread hit was their 1985 global smash “Summertime Girls” (from their eighth album Down For The Count), which played frequently on Baywatch and in several feature films while staying in heavy rotation for months on MTV and on classic rock radio stations. The band’s videos for “Lipstick & Leather,” “Don’t Stop Runnin’,” “Don’t Be Afraid of the Dark” and “Summertime Girls” are still featured on VH1 today. World renowned headliners on their own, Y&T was also for years the most requested supporting act on the hard rock road, touring with icons Ozzy Osbourne, AC/DC and Aerosmith. Known on their first two albums as Yesterday & Today, they shortened their moniker to Y&T after signing with A&M in 1980 in response to their fans’ shouting for encores, “Y&T! Y&T! Y&T!” There were some personnel changes along the way, including Stef Burns (Alice Cooper, Berlin, Huey Lewis) replacing Alves and Jimmy DeGrasso (Alice Cooper, Suicidal Tendencies, Megadeth) taking over for Haze; Haze hooked back up with Y&T in the ‘90s. Since reuniting after a several year layoff in 2001, Y&T has—thanks to a wildly devoted fan base around the world—maintained a crazy as ever schedule of 50-plus dates a year, performing throughout the U.S., Europe and Japan. At any concert you can hear their followers calling out requests from Y&T’s early-to-mid ‘80s heyday with A&M Records: “Rescue Me” from Earthshaker (1981) “Forever” from Black Tiger (1982) and “Mean Streak” from Mean Streak (1983). Earthshaker and Y&T’s near gold selling In Rock We Trust (1984) were re-released in 2006. In 2007, the band released the live DVD One Hot Night, which was shot in Holland in 2006. Since 2006, Y&T has consisted of Meniketti, Kennemore, guitarist John Nymann (who joined in 2003) and their newest member, drummer Mike Vanderhule (who joined in 2006). During the band’s longest break from 1997-2001, Meniketti released two well-received solo projects, the hard rock/blues collection On The Blue Side (1997) and the self-titled Meniketti (2001).